In this article, you will learn about two ways of replacing all formulas with their results in a spreadsheet. To transfer data between sheets or even spreadsheets quickly. To keep formulas from recalculating if cells they refer to change. To save the results of the RAND function. To speed up your spreadsheet performance especially if there are lots of complex formulas. To prevent others from peeping at your calculations when you share or send your spreadsheets (for example, to not give away any extra charges or sales you may offer as a seller). Thus, today I offer you two options for making this possible. Highlight all cells you need to modify. Take all formulas to the clipboard by pressing Ctrl+C on your keyboard. Tip. Ctrl+Shift+V is the Google Sheets shortcut for Paste value only. If you'd rather avoid stumbling over incorrect buttons, we've got you covered. 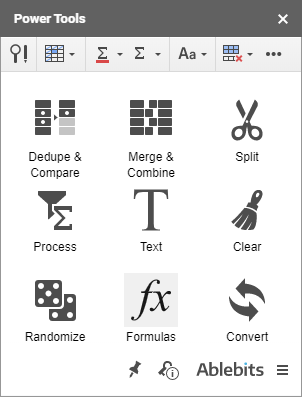 Our Power Tools - a collection of 20+ add-ons for Google Sheets - contains a perfect assistant. Tip. 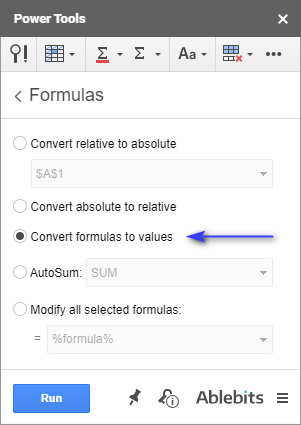 To run the Formulas tool right away, go to Add-ons > Power Tools > Formulas. I highly recommend you to try other add-ons from Power Tools: 5 minutes saved here and 15 there may become a game changer in your work efficiency.